* Pearl sugar can be used if it’s easily available. However, to those who can’t get hold of it, simply use a big pair of kitchen scissors to carefully cut sugar cubes into 3 mm (1/8 inch) pieces. 1. In a small bowl, mix together yeast and milk. Set aside for 5 minutes, or until frothy, then stir in the salt. 2. Place 2/3 flour into the bowl of a stand mixer**. Add the yeast mixture, butter, egg and vanilla extract. 3. With dough hook attachment, mix the mixture until well incorporated. Then slowly add more flour, whilst mixing until the dough comes together – you may not need all the flour. Knead for 8-10 minutes – the dough should be smooth, supple and not at all sticky. 4. Cover stand mixer bowl with cling film (plastic wrap) and chill overnight. 5. An hour before you want to bake the waffles, take out the dough and let it sit for 1 hour at room temperature. 6. Knead broken sugar cubes into dough using your hands. Do not use the dough hook here, it will break up the sugar. 7. Lightly grease waffle iron with flavorless oil and a kitchen (paper) towel. Preheat waffle iron. 8. Divide dough into 7 equal sized pieces. Flatten each one to 8 mm (? inch inch) thick circle (round). 9. 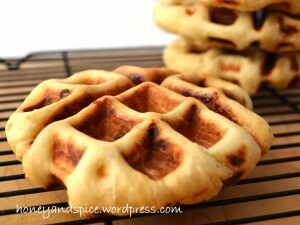 Place 1-2 dough circles (rounds) onto hot waffle iron, close lid and place a large tin (can) of food on top^. Bake for 3-4 minutes, or as recommended by the manufacturer. 10. Enjoy warm as is, or dust lightly with icing (confectioner’s) sugar. ** If you prefer to make the waffles by hand, simply form the dough and knead with nothing but the muscles in your arms. With the moreishness of these waffles, you may need to do the physical activity to counteract the calories! ^ Unless you have a heavy lidded waffle iron, the rising of the waffles during baking will cause the lid to pop ajar. If not weighted down, it will create a waffle without the distinct “holes”. Of course, they will still taste delicious!